1. Put the potatoes in a pan of salted boiling water and cook for 10 minutes or until just tender; drain and set aside. Meanwhile, put the chicken breasts between 2 pieces of cling film and, using a rolling pin, bash out the thicker ends until they are even all over. 2. Heat the butter with ½ tbsp oil in a frying pan. Add the shallot and garlic, then cook gently for a few minutes until soft. Add the peas, stock, sugar and potatoes; continue to cook for 4-5 minutes. Take off the heat and stir through the prosciutto and vinegar. 3. Meanwhile, heat a griddle pan over a high heat. Brush the remaining ½ tbsp oil over the chicken, season and griddle for 4-5 minutes on each side until cooked through and no pink meat remains. 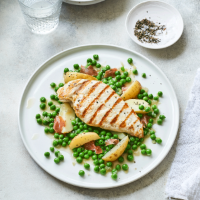 Divide the peas and potatoes between 2 plates and top with the chicken. This recipe was first published in Thu Jul 26 12:40:20 BST 2018.